Mr. Mathew Akinlade (FCA) started his accounting career about 44 years ago. He is an experienced and seasoned professional of the accounting profession and has experience spanning the manufacturing and engineering industries. 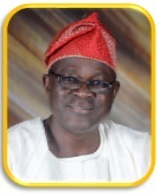 He served on the board of the number listed companies such as Nampak Nigeria Plc, NCR Nigeria Plc, amongst others. He is a fellow of the Institute Chartered Accountants of Nigeria (ICAN), a member of Chartered Institute of Taxation of Nigeria (CITN) and a fellow of the Chartered Institute of Management Accountants (FCMA), UK. Mr. Akinlade (FCA)’s appointment is effective April 27, 2017.